Columnist Marianne Bohr, whose first book, Gap Year Girl, came out at the start of this month with She Writes Press, recounts a time during her travels in France when she and her husband felt suddenly out of place and full of longing for home. Ironically, however, the most apt expression she could think of to describe this feeling was French! They’re inevitable. Those days that occasionally, and sometimes from out of nowhere, invade the life of a long-term international traveler or expat. You miss home, you’re a stranger in an alien place, you’re gripped by le cafard. While French has an expression for homesickness (mal du pays), I prefer the other term, le cafard, to describe this dark visitor. It literally means “the cockroach”. Photo credits: Alone In The Dark, Nobody Waiting, by Môsieur J.; (inset) Gaspard le cafard, by InOutPeaceProject. Both images via Flickr (CC BY-SA 2.0). Seven weeks into our year of living in Europe, homesickness hit and hit hard. My husband, Joe, and I were in southwestern France. The fall weather had turned decidedly cold under steely gray skies and thick cloud cover—never good for lifting one’s spirits. Though we never imagined our adventure abroad would be daily champagne and constant merriment, we didn’t expect the blues to make their appearance so soon. Exploring endless desolate, medieval stone hamlets had darkened our mood. Everything had been touched not only by the savagery of the Hundred Years’ War between the French and English in the 14th and 15th centuries but also by the 13th-century Cathar Crusade. 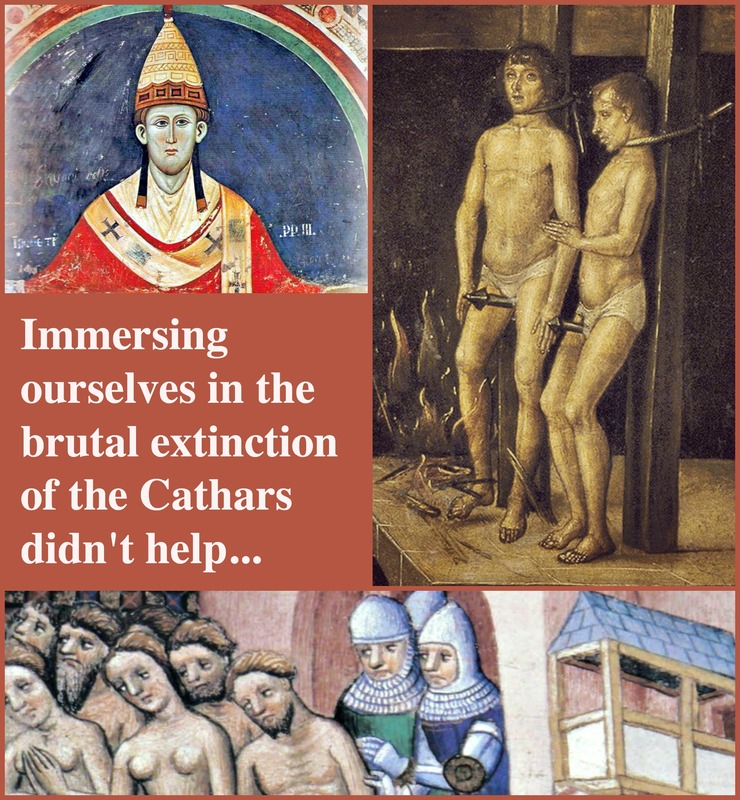 Prior to leaving for Europe, I’d read extensively about the Cathars and decided that we had to visit the region in which this shameful yet fascinating period of history took place. In a sunnier clime, this history might have been remote and intriguing. But against a backdrop of unrelenting gray with no access to the Internet, it left us feeling fogged in and low. Very low. After visiting so many places that witnessed sieges, starvation, plagues, pestilence, and butchery, even the cheeriest of souls would have succumbed to its grip. Photo credits (clockwise from top left): Pope Innocent III wearing a Y-shaped pallium, by unknown 13th-century artist; “Saint Dominic presiding over an Auto da fe” (detail), by Pedro Berruguete; Expulsion of the inhabitants from Carcassone in 1209, taken from the manuscript Grandes Chroniques de France. All images via Wikimedia Commons. It’s a bug that thrives in the dark—and in the Dark Ages! Melancholia, tinged with some serious mal du pays, reared its ugly head without warning. Perhaps we’d had our fill of cold, antiquated spaces and lonely, abandoned stone villages. Or perhaps the total absence of others to provide even a bit of people-watching diversion had brought us down. But maybe we were just in a trough of the normal vicissitudes of travel. To put it simply, we missed our children and we missed our country—we’d come down with a serious case of le cafard. Despite knowing that immersing ourselves in the brutal extinction of the Cathars might not be what we needed to improve our dispositions, we plowed ahead toward our next destination: Caunes-Minervois, just north of Carcassonne. On the way, we stopped and hiked the steep Cathar hill town of Cordes-sur-Ciel, where the region’s alleged heretics had taken refuge, and took a long midday break for a sunny, outdoor lunch in Albi (home of Toulouse-Lautrec), with its austere, imposing redbrick cathedral of Sainte-Cécile, unlike any other church in the world. We noted that the cylindrical exterior of its nave looked like a space shuttle ready for launch. 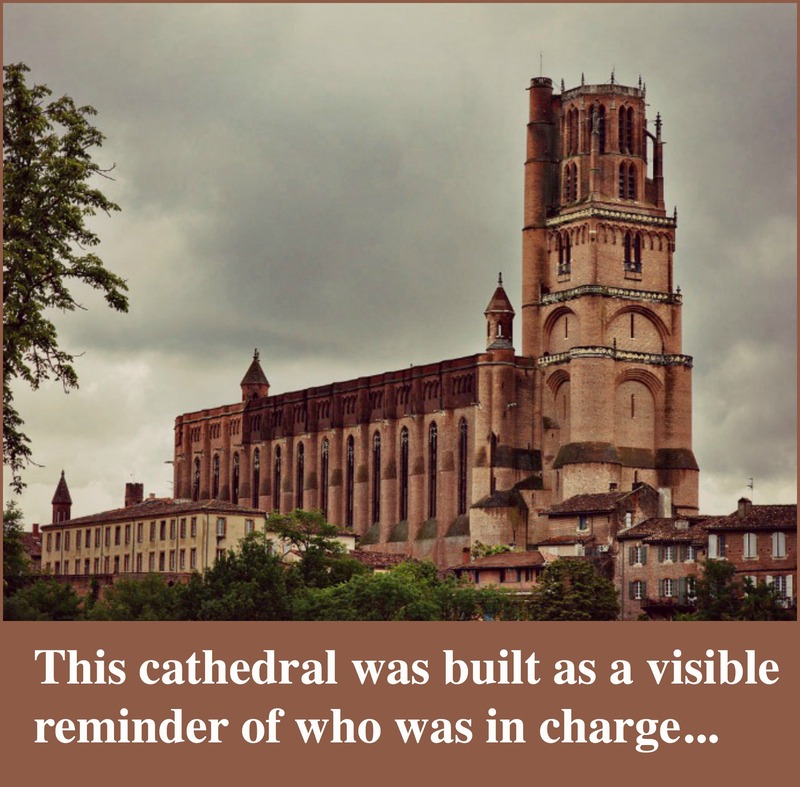 Sainte-Cécile was built after the Cathars were wiped out as a visible reminder to those who might be thinking of defying Rome not to forget who was in charge. Photo credit: Cathédrale Sainte-Cécile d’Albi, vue de la rive opposée du Tarn, by Jean-Christophe BENOIST via Wikimedia Commons (CC BY-SA 3.0). 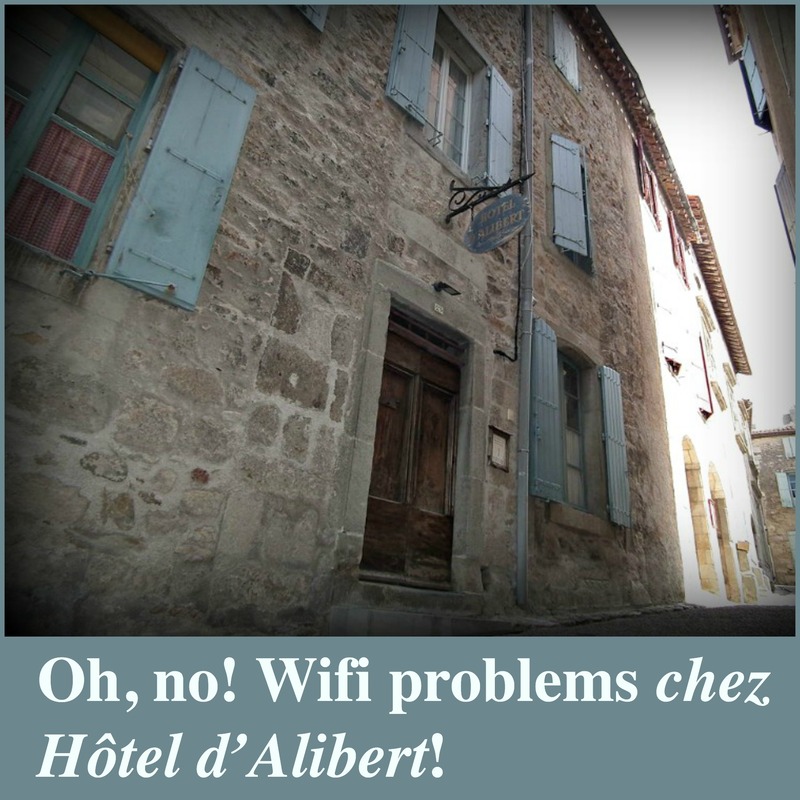 Back on the road, we drove farther south into the Montagne Noire to our ultimate destination: the constricted streets of Caunes-Minervois, where our Internet-enabled hotel awaited. It had been over a week since we’d communicated with our children, and we were lost in reverie about what we would learn when we fired up our laptops. Our son had had an interview the last time we spoke. Did he get the job? we wondered. Our daughter was coming down with a cold. Was she feeling better? Did my latest Amex payment process, and was the house we hoped to rent in Spain still available? Photo credit: Hôtel d’Alibert à Caunes-Minervois, by Gaël Gendrotvia Wikimedia Commons (CC BY-SA 3.0). We were enraged and on the verge of tears. Here we were in yet another deserted town with no means to connect. We dragged our devastated spirits up the spiral stone stairway to our room and dropped our luggage. 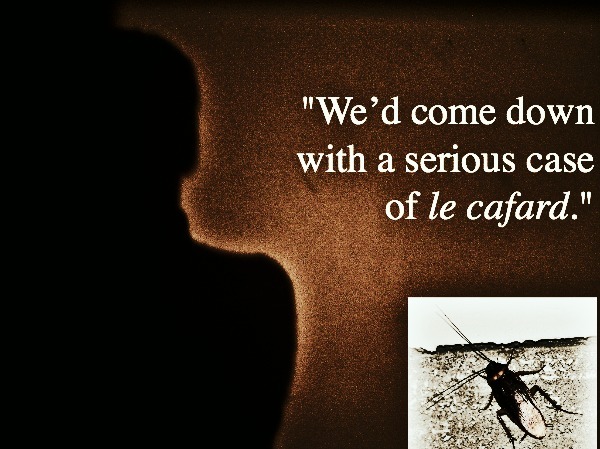 Le cafard attacked with a vengeance. For the rest of the evening, in a fit of pique, we seriously contemplated the possibility of returning home—of giving up on this gap year business—but finally agreed that all would be better in the morning. After our night of frustration and reflection, the morning light bolstered our resolve to rally. Now back stateside, I still refer to a bout with the blues as le cafard. It just seems so perfect a term. How do other languages express this feeling of profound melancholia? Are there expressions in other languages as accurate as the French? Thank you, Marianne! How well you’ve described, with the help of that vivid French metaphor, the sense of alienation that at some point or another plagues all of us who venture beyond borders to travel or live. The word we use on this site, “displaced”, simply isn’t strong enough! Readers, do you have any suggestions for words or sayings in other languages that can convey these feelings? Do let us know in the comments! 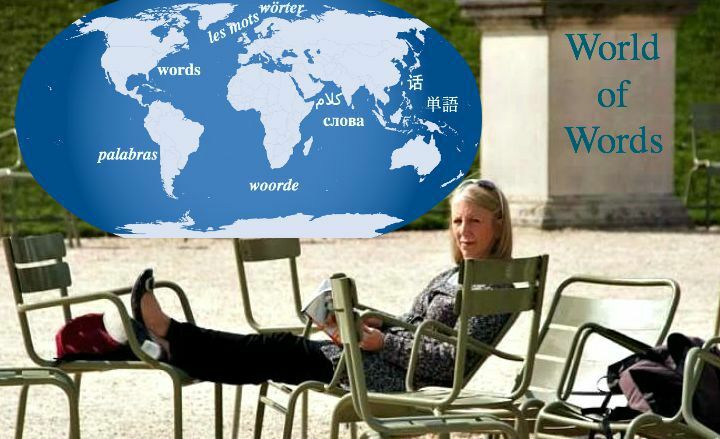 Marianne C. Bohr is a writer, editor and French teacher whose book, Gap Year Girl: A Baby Boomer Adventure Across 21 Countries, was published in early September (She Writes Press). She married her high school sweetheart and travel partner, and with their two grown children, follows her own advice and travels at every opportunity. Marianne lives in Bethesda, Maryland, where after decades in publishing, she has followed her Francophile muse to teach French. She has an author site where she keeps a blog, and is active on Facebook and Twitter.